How to delete duplicate iTunes music on external drive? Will Tune Sweeper remove duplicates if my iTunes music is on an external drive or Network drive? Yes - Tune Sweeper will work fine if your iTunes music is stored on a network drive or an external drive such as a USB drive. Ensure that your music files are available to your computer file system before running Tune Sweeper. For example, you should be able to browse your music files using Windows Explorer (PC) or Finder (Mac). Download, install and launch Tune Sweeper. Once you have decided which duplicate groups in iTunes you wish to remove click on 'Remove Duplicates' button in Tune Sweeper. 1. Firstly, use Tune Sweeper to search for duplicates by double clicking on the Tune Sweeper icon to run the program, then selecting "Search For Duplicates". 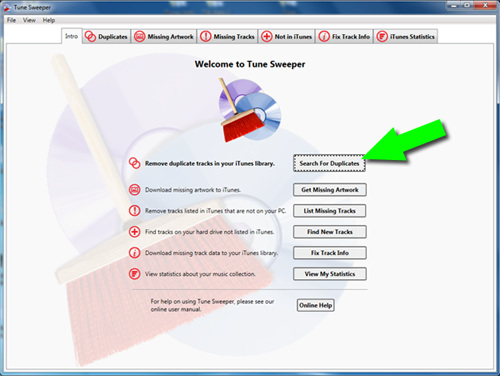 See the Tune Sweeper user guide for details on how to configure Tune Sweeper's duplicate search criteria. 2. Tune Sweeper can help you decide which iTunes duplicate you wish to keep and mark the rest for removal. See the Tune Sweeper User Guide for details on how to select which track to keep with Tune Sweeper. 3. Click on Remove Duplicates in Tune Sweeper.You can optionally select that Tune Sweeper will copy the tracks it removes from iTunes to your recycle bin. This will allow you to restore the tracks from the recycle bin if required or empty the recycle bin when you no longer require the files and want to claim back the disk space they are using.